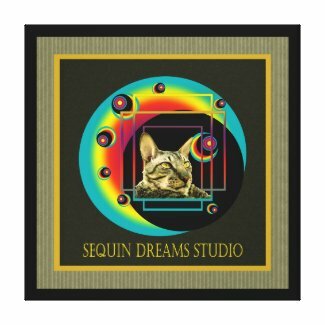 I've been revamping my Zazzle Site and have opened up a new store for my latest designs inspired by Orbs and Vintage Posters. Below is an image of an Orb with a cats face inside. I've recently had photos taken of me and my friends at an Angel Party with orbs in them which intrigued me to find out more. When I enlarged the photos of the orbs I noticed they had little faces inside them with different expressions. Photographs with Orbs in them are becoming more common now with everyone shooting with digital cameras. This image of my Cat Benson reminds me of orbs traveling in space.